Note: These books require the free Adobe Acrobat reader. Click the logo below to download this utility. (free) Spirit: Divine and Human. 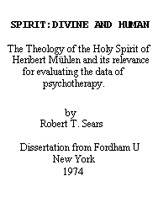 The Theology of the Holy Spirit of Heribert Muehlen and its Relevance for Evaluating the Data of Psychotherapy. This dissertation from Fordham, 1974 still has its relevance for the grounding of my theological viewpoint. It is technical, with many references, but the work of Heribert Muehlen is still mostly in German and not available in English, and the application to a theology of psychotherapy is still important. The introduction is a free download. I ask a donation of $10 for downloading each copy of the book which is 516pp. If you want a bound copy of the book, It is available from the following number: 1 (800) 521-0600 ext. 7044. The call number of the book is 7425083. The cost for academic buyers: $63 hard cover, $50 soft. For all other buyers: $91 hard cover, $74 soft. Unbound for both is $41. 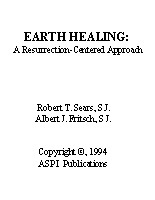 (free) Earth Healing: A Resurrection-Centered Approach. by Robert T. Sears, S.J. and Albert J. Fritsch, S.J. The introduction is a free download. I ask for a donation of $7 for downloading each copy of the book. 168 pp. 910 KB. 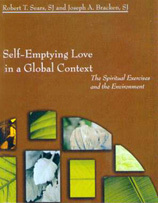 Self-emptying Love in a Global Context: The Spiritual Exercises and the Environment. 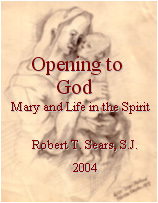 by Robert T. Sears, S.J. and Joseph A. Bracken, S.J. Please note: These books may also be sent by mail. I could also send you a copy of either book with a black and white cover by mail (at $18 per copy including postage). Simply contact me and pay either by Paypal (see below) or directly to me by check (Robert Sears SJ). Copyright © 2015 Robert T. Sears. All rights reserved.